The Seneo WaveStand 153 Fast Wireless Charger is one of the best wireless charging stands on the market. Not only does it charge the most popular smartphones at maximum speeds, but the price is extremely wallet-friendly. As phone makers try to reduce ports on their devices, wireless charging is becoming a more common and effective way of replenishing your depleted battery. The Seneo WaveStand 153 Fast Wireless Charger is one of the manufacturer's fast wireless charging products that can be used by Apple and Android users alike, giving you speedy charging at an affordable price. The Seneo WaveStand 153 Fast Wireless Charger has a minimalistic design with straight, simple edges. One of the unique features is the slight pinnacle top that offers a streamlined look. Aesthetics aside, there are also vents that dissipate heat allowing your phone and the charging stand to stay at a reasonable temperature. The base of the stand has a dim LED light that indicates when the phone is charging up. It’s not too bright, and it won’t disturb your sleep at night if you have it next to your bedside. Seneo includes a user manual for the charger, but there’s not a whole lot of science that’s needed to set up the product. Use the included USB cable to plug into the micro USB port on the wireless charger. An AC adapter is not included so you will have to bring in your own and make sure it’s fast-charge compatible. Once everything is plugged in, you simply place your device on the stand and your phone starts charging with the LED light indicating it’s positioned correctly and powering up. For our test of the Seneo WaveStand 153 Fast Wireless Charger, we used an iPhone XS Max that had its battery depleted until it automatically shut off. We kept the device in that state for about an hour to allow it to cool down before starting to charge it again. It took a little over two hours to power up to reach full battery. It took a little over two hours to power up to reach full battery. During charging, we didn’t notice an excessive amount of heat buildup, either with the stand or the phone itself. 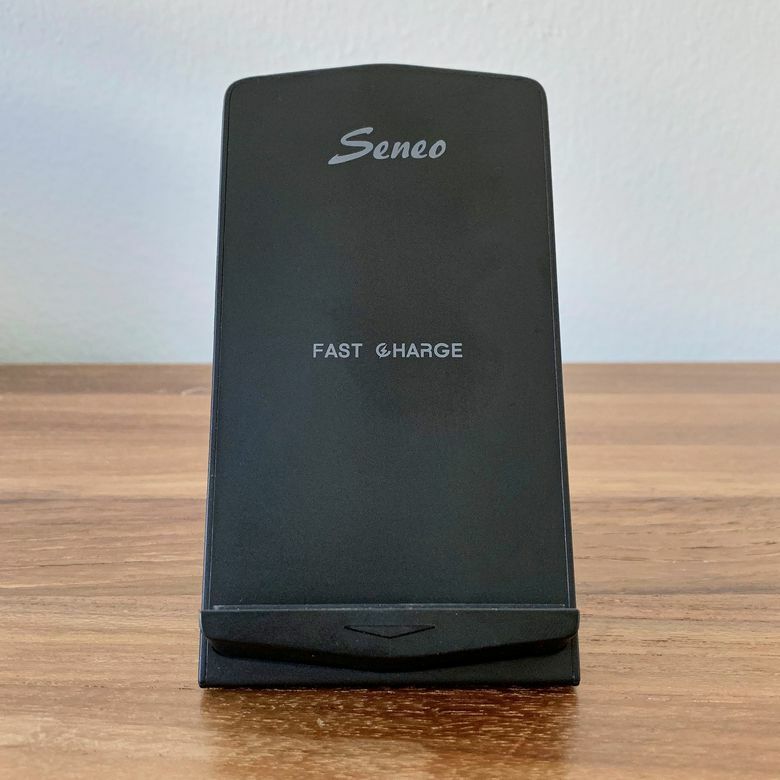 Seneo claims in their marketing materials that the charger is equipped with what they call ATB Technology (Automatic Temperature Balance), which allows for faster charging without overheating. Seneo says that 7.5W fast wireless charging speed is for iPhone Xs/Xs Max/XR/X/8/8 Plus, while the 10W wireless charging speed for Samsung Galaxy S9/S9+/S8/S8+/Note9/8/S7/S7 Edge/S6 Edge+/Note5 while the rest of the Qi-enabled devices will charge at 5W speeds. For those of you that have a case to protect your smartphone, Seneo says that as long as the thickness doesn’t surpass 5mm, the charger should be able to power up with no problems. The Seneo WaveStand 153 Fast Wireless Charger costs less than $20. Budget-conscious consumers that want their phones to charge at the best speed will be satisfied with this purchase. Amazon also offers frequent sales or discounts, so if you can get it for anything lower it’s a steal. Budget-conscious consumers that want their phones to charge at the best speed will be satisfied with this purchase. The Seneo WaveStand 153 Fast Wireless Charger competes with a plethora of other chargers in the marketplace. Not many people may have heard of the Seneo brand which may cause them to be overlooked in favor of something more recognizable like any of the Samsung offerings. Samsung’s charging stand retails for $69.99, an immense premium over Seneo’s stand, however, it does come with a power brick in the box as an added bonus. With the AC adapter included, it allows the customer to know they are using the optimal cable and brick to power up their device. However, at the price Seneo is selling at, having to buy an additional AC adapter isn’t much of a burden. See more reviews of our favorite wireless phone chargers available for purchase. No compromises with this budget-friendly charger. The Seneo WaveStand 153 Fast Wireless Charger is your best option if you want to reduce your cables and replenish your battery in an easy, wire-free way. With the Seneo charging both Apple and Samsung phones at their respective maximum speeds you can be sure you’re getting your money’s worth. Product Dimensions 4.72 x 2.95 x 3.54 in.